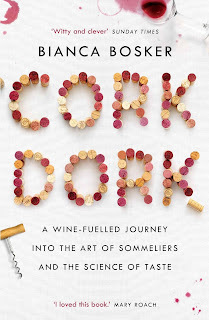 In a friendly, personal way, Cork Dork takes the reader into the very strange world of the American sommelier (I'll come back to the A word a little later). The author, Bianca Bosker gives up her job to investigate this bizarre sub-culture as an immersive journalist, only to end up becoming part of it. Like many, I enjoy wine (though I prefer a good real ale with a meal), but find the whole business of flowery, pretentious descriptions and ludicrously inflated prices for the better bottles off-putting and something that feels like either a con or self-deception. Bosker promises to transform our views. The book certainly made me think a little more about the whole business - and her exploration of strange people and their obsessions makes for an excellent read - but I can't say it's changed my viewpoint. While it's clear that you can train yourself to distinguish more in taste and smell than most of us do - and the sommeliers do this to extreme - that doesn't really help the rest of us or explain why we should consider paying £100 or more for a bottle of wine. And it's very clear from what Bosker uncovers that the whole business is extremely subjective and involves a lot of self-deception. This comes across in a number of ways. For example, she points out that in tests, the experts quite often rate the same wine totally differently - for example an identical wine in different bottles being described at the same event both as undrinkable and gold medal quality. And, to Bosker's frustration, the sommeliers persist in believing the totally discredited tongue map model of taste. All the way through there's a sense of being pulled in two directions. Yes, there's a remarkable achievement in being able to blind taste a wine and identify its grape, origin and vintage... but most of the descriptions they give convey no information and are pointless, while despite caring about what's good in wine, sommeliers are, in the end, in the business of extracting as much money from their customers as they can, so can't really be trusted. Some of the most interesting parts of the book are where she moves away from the sommeliers and takes in other aspects of the wine industry. I found particularly fascinating just how industrial the US basic wine industry is. I know even the top notch producers these days make use of plenty of tech, but I hadn't realised how much cheap wines can be chemically manipulated for taste, odour and colour. There are some problems with the book. It's about one third too long, repeating similar observations about sommeliers and their views too many times. It is also very US-oriented - the whole setting feels alien from a UK viewpoint and it doesn't give any idea of what the equivalent situation is here. Perhaps worst of all, there is no real acknowledgement of the increasing medical evidence of the damage caused by anything more than very moderate alcohol drinking. At one point, Bosker suggest we only drink, say, Chardonnay for a week to get a feel for it. That somehow doesn't feel like the recommended alcohol intake level. The book is, in some ways, a celebration of self-destruction without acknowledging it. I'm very glad I read it, though - and will think slightly differently next time I'm faced with a wine list, perhaps even daring to ask the wine waiter (I don't really like the 's' word) for advice. But given what she reveals, I find Bosker's Damascene conversion from journalist to sommelier baffling. Cork Dork is available from Amazon.co.uk and Amazon.com.